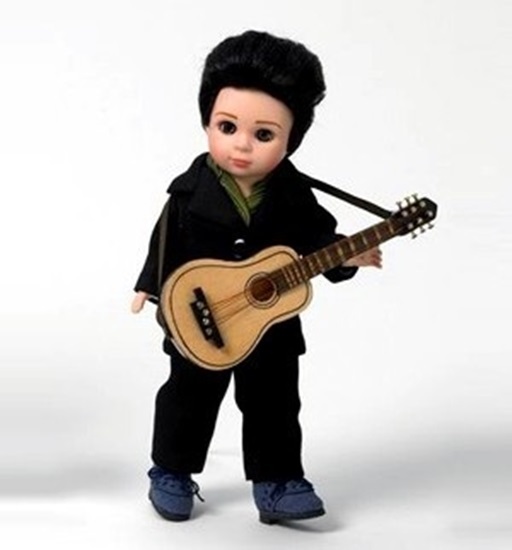 Judy's Doll Shop | Elvis Presley "Blue Suede Shoes"
He may thing he "Aint Nothing But a Houndog", but this 8 inch fully articulated Wendy doll is sure to rock his way into your heart. This blue-eyed boy with black 'Elvis' hair has styled an entire outfit around his blue suede shoes: black wool pants and jacket; a green striped shirt and white socks are put together to a 'so like the King' effect. Then there's his guitar, the piece de resistance to Elvis Presley® Blue Suede Shoes™. He wouldn't go anywhere without his brown beauty with the black strap. Elvis is perfect for ages 14 and up.